When you go through a divorce process in California, there potentially are many things to address. One of these may be whether or not you and your spouse have any community property. Sometimes, the identification of the status of a property can be murky, especially if a community asset’s sale may not have been valid. In a recent case involving two apartment buildings sold using a forged deed, the courts were asked to decide whether the sale was valid. In this case, the Second District Court of Appeal ruled that the wife couldn’t challenge a forged deed because she had pro-actively taken many steps that blocked her from going back and arguing that the sale should be invalidated and the buildings deemed to be omitted community assets. In the divorce trial, the wife’s lawyer asked her if the couple had any community property. The wife said they did not. The divorce judgment indicated that there was no community property. Seven years later, in 2013, the wife went back to court, asking the judge to throw out the ruling of no community property and award her 100% ownership of the apartment buildings. One of the bases for her claim was that her and the husband’s signatures on the 2002 deed had been forged, a fact to which a handwriting expert testified at the divorce trial. According to the wife’s appeal, the trial court, once it found the signatures to be forgeries, was required by the law to find the deeds void (or automatically invalid) instead of voidable (or potentially capable of being invalidated). The 2002 deed was actually void, meaning the property still belonged to the couple as community property and was subject to community property division as an omitted asset, she argued. Unfortunately for the wife, her deed argument failed. Even though the law generally says that “a forged deed ordinarily does not transfer good title,” there are certain situations in which an owner’s own conduct may create a legal barrier to asserting court claims based upon the deed’s invalidity. That’s what happened to this wife. The wife accepted the $80,000 payout for the buildings and used it to buy a restaurant. She also identified herself to third parties (including the government when she applied for need-based aid) as a tenant in one of the buildings, rather than an owner. All of these actions essentially estopped, or barred, the wife from going back and asserting the deed should be judged to be void. This case is useful for its information regarding when property deeds can be void or voidable and how this can affect the division of your community property in your divorce. Divorces, especially ones with community property, can have many different elements with which you need to keep up, as this case showed. 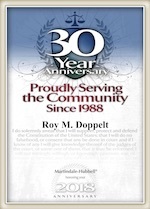 The experienced San Diego divorce attorneys at Doppelt and Forney, APLC can assist clients throughout Southern California, including in San Diego, Encinitas, La Jolla, and Chula Vista, with a wide array of divorce issues, including all sorts of cases involving community property. For a free consultation, reach out to Doppelt and Forney, APLC through our website or call toll-free at (800) ROY IS IT (769-4748).